Internet is our world. 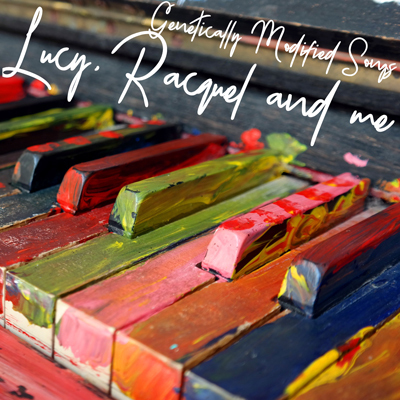 Together we create catchy pop/folk songs under the name Lucy, Racquel and me, our first album is out and it needs you to be heard. Social links: Facebook, soundcloud, The album in streaming: soundcloud.com, to download: goo.gl, the artwork and of course, on Itunes, Deezer, Spotify ... n this evening’s edition of the Independent Spotlight, we shine our gaze on a rather peculiar, but immensely fascinating act. They’re called Lucy, Racquel and Me. As the name alludes to, they are a three piece creative effort. They haven’t ever met, however, and their collaboration is conducted entirely through the internet. This has become somewhat more common in recent years in the independent music scene, but it’s not often you see an outfit as coherently constructed in this fashion as Lucy, Racquel and Me. Let’s explore their new self-titled debut album and discern whether or not they’re worth adding to your music collection. To provide some context, Lucy is a lyricist from Canberra, Australia. She wrote or co-write most of the songs on the album. Racquel is a vocalist from California who performs said duty throughout the whole album. Finally, ‘Me’ is the composer, who resides in France. To be entirely honest, I’m still not entirely sure who ‘Me’ is - the final third of the puzzle isn’t as directly credited as the previous two. To be fair, though, the name of the band also does this - the third and final person isn’t named, but Lucy and Racquel are. Again, all of this concretes the impressiveness of these three being able to craft any sort ‘complete’ sound across vast distances. The new album, which was released a week ago, is eleven songs long. Thus, it’s quite a lengthy endeavor, all of which can be streamed on Sound Cloud now. The music takes a cue from the Beatles and Paul McCartney in style, something that works for it nicely. (Technically, all music takes a cue from the Beatles, but Lucy, Racquel and Me are clearly very directly inspired.) Hence, the album is mostly soft rock tinged with pop sensibilities. This makes the album very accessible; I’m sure most music fans will find something to appreciate or at least hum along to this album. The opening of the record is ‘Hello Sunday,’ a track where Racquel harmonizes with some overdubs of herself to wonderful effect. It’s easy riding, smooth to listen to, and very well produced, setting an excellent tone for the album. The song’s lyrics lack some depth, but if we’re being honest, so did a lot of the early Beatles catalog. It’s a song designed to make the listener feel good. It does that very well. The atmospheric ‘Shattered’ continues the trio’s journey through eclectic sonic experimentations on this album. It’s worth noting how complete and organic these songs feel. Every piece of ‘Shattered’ and its counterparts feels completely authentic, as if everything was recorded in the same studio at once. This is the biggest hurdle a project like this has to overcome, and I think Lucy, Racquel and Me have mastered it surprisingly well - perhaps better than any other group I’ve seen attempt this. ‘Untraceably Gone’ is definitely a bit odd to listen to this time of year - this is definitely a winter song both in content and in spirit. It sounds like it’s off a Christmas record, which does make it feel a bit out of place after four tracks that don’t even step in that kind of direction. On the flip side, though, it’s a really stunningly performed song that does do an apt job at showing the trio’s prowess can go in a very different direction. I think Lucy, Racquel, and Me could tackle a variety of genres to great success. ‘Love Now’ is another love ballad, one that takes a page out of the ‘All You Need Is Love’ songbook. It’s probably the most bubblegum song of the collection, but it isn’t without its merit, especially when followed by the fiercely independent ‘Gone Baby Gone.’ The two accentuate each other nicely. In some ways, these songs seem to catalog the downfall of a relationship. ‘Love Now’ is the beginning, and songs like ‘What Did We Do Wrong?’ definitely denote the end. ‘All True,’ however, may be the best of those more melancholy break-up songs. Racquel’s performance is absolutely fantastic. I must laud Lucy, Racquel, and Me. I get a lot of music from artists that collaborate over the internet and it very often shows. It doesn’t one bit here, though, and their new album is very much worth listening to. It doesn't at all sound like it was recorded so differently. It’s a splendid journey that makes one eagerly anticipate the next.